PRESS RELEASE: Livid Instruments announced today the release of their new MIDI control instrument, Code. The newest member of their controller family breaks the mould of the button grid with a push-button encoder grid, adding valuable knob turns to trigger actions. "Since the release of our first Ohm model, a lot of customers have been asking for a knob-intensive controller" explains Peter Nyboer, Director of Software for Livid. "We like the compactness of potentiometers, but it seemed too simple, and maybe a better DIY project than a final product. So we took our time and developed a thoughtful and extremely flexible controller unlike anything else on the market." Code has an array of thirty two encoders with LED rings, unified with push buttons with a separate LED for the button feedback. 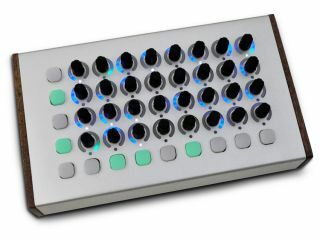 Thirteen back-light rubber buttons surround the encoder grid for added features and functionality. Code is housed in a sleek and portable aluminium enclosure with hand-crafted mahogany wood sides, giving it Livid's signature "instrument" look and feel. Nyboer, who is responsible for the software tools that are available for Code goes on to explain, "With Code we are really trying to set a standard for the future of our products. We've packed a lot of features into this controller: addressable LED rings, MIDI in and out jacks, push button encoders, a firmware bootloader, and an editor that lets you change all of the settings and encoder modes. Living up to the device's name, we've made the firmware is open source for expandability and customization. Other companies are working towards planned obsolescence," he continues, "but we are working for future relevance." Code is handcrafted in Livid's Austin, Texas shop and provides endless possibilities for use with software such as Ableton Live, Max/MSP, Propellerhead's Reason and Record, and NI Traktor to name a few. Code has an MSRP of $469 and is available now from lividinstruments.com, and dealers worldwide.